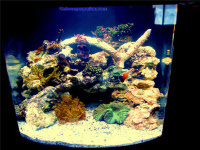 Here Is a picture of Chads Tank one of our locals. If you are looking for saltwater corals and such let us know he ships world wide!! For General suppport please post on our fish forum. General support includes what product would be best for this or that. For pricing and other questions on aquarium related products please email as it is easier for us to respond. Please include name , address, zip and your question. We are housed in the beautiful majestic St Louis - St.Charles area and are dedicated to have happy, satisfied aquatic customers. We do our best to provide timely professional service with quality being our #1 goal. Some aquarium or pond items are shipped directly from our supplier and are not available locally in stock. We provide credit card transactions through an independant service which is on a Secure SSL server that is insured up to $100,000 If you have any questions or comments please feel free to email us. creditcards@Aquatic-Store.com.